It is so great to be back in Almaty! The city is totally different under a foot of snow and in below-freezing temperatures, but it is still Almaty! The signature Kazakh hospitality, conversations with random cab drivers and the city's unique charm are ever present. After a long flight from Washington through Istanbul, I arrived in Almaty Wednesday morning. My friend Meiirbek picked me up with his mom and I had breakfast at their apartment. They crystallize signature Kazakh hospitality. We had kasha, cucumbers, tomatoes, cheese -- the traditional Kazakh spread. And of course, tea with milk. They then drove me to my friend Dasha's apartment, as I am staying with her. After I spent most of the day sleeping, Dasha came home with a bag of oranges, chocolate and chai, and we had classic Kazakh chai-time. Yesterday was a busy day -- I had a meeting at the International Science and Technology Center (ISTC) and chatted with the head as well as the head of Nuclear Physics. We had a wonderful discussion about Kazakhstan's scientific, technology and academic community prior and following the dissolution of the Soviet union. I was so touched by the signature Kazakh hospitality of the office manager at the ISTC. She asked me if I was staying alone and had plans for new years. I told her I was with a friend and she said. "Good, New Years is a family holiday, I would hate for you to be alone." This, my dear readers, is why I love this country so much. The people are so genuinely gracious -- hospitality is a national character trait. During the interview at the ISTC, a Professor walked in to wish the director a warm holidays. It turns out, he is a Professor in the atomic radiation department at Al-Farabi University. He graciously invited me to meet with one of his colleagues who works on atomic radiation. 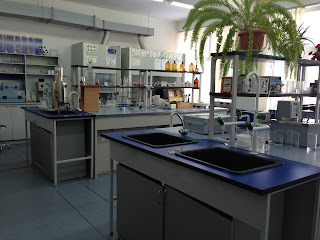 The Professor graciously introduced me to his colleagues and they generously shared their time with me, showcasing new equipment for studying the long-term effects of the Soviet nuclear tests at Semipalatinsk on the environment. One current project, for example, is measuring the levels of tritium in the water surrounding the test site. (For those of you who lack an extensive background in chemistry, like myself, tritium, as it has been described to me, is the chemical in bombs that make them go "bomb!) A PhD student also showed me the university's new equipment used for exploring levels of gamma radiation. One of the machines, for example, was purchased by NATO and used in a project on exploring levels of deposit uranium in Kazakhstan and Kyrgyzstan. The math and physics building was constructed only two years ago, and all of the equipment certainly is on par with that of Georgetown's. I was really impressed with the new quality of the labs and the knowledge and hospitality of the scientists. All of the professors and PhD students spoke english, but we mostly chatted in Russian and if there was a term I did not know I asked for clarification. In fact, I learned that if a scientist speaks english, their pay is three times higher! I also met with one professor who told me how after the fall of the Soviet Union, Kazakhstan lacked experts in atomic radiation and atomic studies. Now however, that gap has been somewhat narrowed, as the government has actively supported sending students abroad to study. One PhD student I spoke with just returned from her second three-month trip in Slovenia, where she conducted research and collaborated with international colleagues. After speaking with the professor, I sat in a room with a PhD student and took some notes on a book published in 1997 from Moscow on Semipalatinsk one of the Professors gave me. The book detailed studies commissioned by Moscow during the Soviet union on the tests, their environmental impact and the correspondances between Moscow and local staff. The book also detailed how the local scientists were affected. Again, really interesting stuff. By this time, I was tired, and went to a cafe, where I then met up with Dasha and we had dinner with our other mutual friends. Alas, it is morning, and I'm off to the library for the day, and maybe some interviews. We'll see where the day takes me! Lab for the study of atomic radiation and the environment at KazGU named after Al-Farabi. 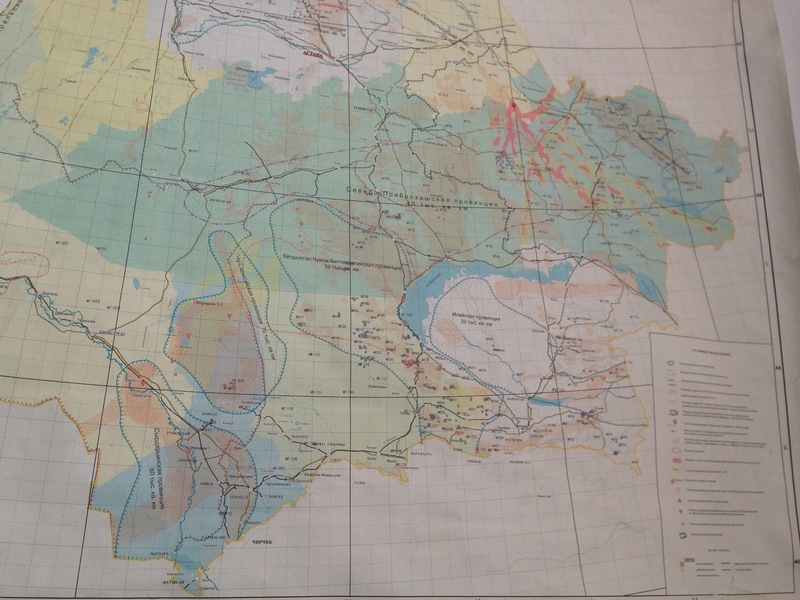 Portion of Map, produced by Kazatomprom, on the wall at KazGU named after Al-Farabi that illustrates former nuclear test sites (primarily Eastern Kazakhstan) and uranium mines (Southern Kazakhstan). I personally LOVE maps and was so excited when I saw this -- unfortunately I was unable to get a copy. It so vividly depicts how Kazakhstan's environment was affected by Soviet nuclear tests and how the country will undoubtedly face this legacy for generations to come.